Also famously known as the "Oriental Garden Lizard" , Crested Tree Lizard or Eastern Garden Lizard, The Changeable Lizard is as insectivore lizard found widely distributed in Asia and has been introduced in Many other parts of the world . It has a spiny back with 2 small groups of spines perfectly separated from each other. Based from the name , this lizard species can change its color from a general ground ( light brownish olive) color , to a bright red, to black or even to a mixture of both. Interestingly males get a bright red throat in the breeding season. Unlike other lizards they do not drop their traits ( Autotomy ) and their tails can be very long , stiff and pointy. Like other reptiles they shed their skins. Like chameleons Changeable Lizards can move each of their eyes in different directions. 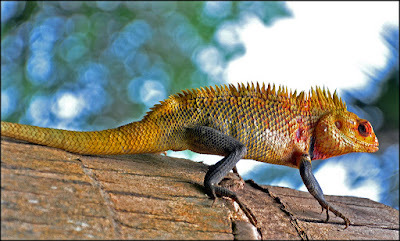 Its name" Crested Tree Lizard " is derived from both males and females having a crest from the head to nearly the tail..
Their diet mainly consists of insects , small vertebrates and at its clutches , they prey is shacked about rapidly in order to be stunned only to be swallowed whole afterwards -not being teared up as their teeth are designed for merely gripping prey..
Changeable Lizards are quite common and adapted very well to humans ..